Power windows work, have disconnected the battery, etc. Any ideas? Currently trying the hard reset! I'm hoping it will just forget it was ever messed up and work for me! Nicely said, cars are a lot like people. Looking forward to hearing the result. Best to leave it for a few hours before re-connecting. When you re-connect, connect the ground last -- and make it a quick connection so it doesn't get a lot of voltage drop initially. The forum readers have a good suggestion in the TIPM hard reset. If it doesn't work you can suspect the instrument cluster, in that it needs to communicate with the TIPM. A giveaway clue is that if you open the door and don't get the LED display for odometer etc, that is to say your instrument cluster is blank, then you can suspect it. Any ideas on it being stuck in park? Same Problem with gauges and wipers. I have the same problem with my 2007 JK. I have a switch installed on the neg battery terminal to disconnect the battery for towing behind my motor home. If I just turn of the battery switch and turn it back on it resets something and works normal. 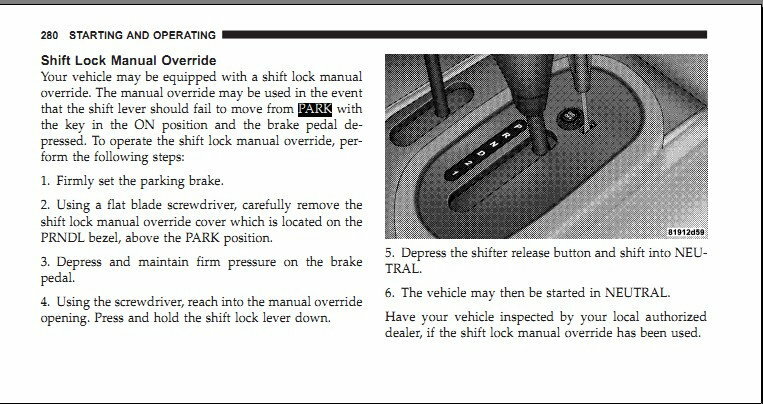 As long as the Ignition switch is in the run position or accessories position every thing works fine. After about 3 to 5 mins in the off position I have to reset it with the battery switch. For a while too low or too high humidity was the problem but now it makes no difference what the humidity is inside the can. The ding with the key in the switch and the door open means it is ok. If the is no ding it has to be reset. The wipers run as soon as and as long as the key is in the run position, the guages, turn signals don't work and other weird things happen. Did anyone figure out what is causing this?